This Thursday, January 15th, the Senate Judiciary Committee will hold a hearing to decide whether nominee Eric Holder should be confirmed as the new Attorney General. Over the last 8 years, the Bush administration has systematically dismantled some of the most important rights and protections in the U.S. Constitution. While Holder’s public statements suggest he would be a marked improvement over Alberto Gonzales and Michael Mukasey, it is critical that the American public be certain that our nation’s chief lawyer has an unwavering commitment to upholding the rule of law. Senate Judiciary Committee members have a serious responsibility to put an end to subverting law to politics – and to ensure that President-Elect Obama appoints an Attorney General who will help him restore, protect and expand our human rights. And it is our responsibility to make our voices heard and stand against torture and other violations of human rights. Are you, unlike your predecessor, willing to acknowledge under oath what U.S. military and civilian courts have recognized for over 100 years: that waterboarding is torture and therefore criminal? If so, will you fulfill your duty to ensure that justice and the rule of law apply to all by appointing a Special Prosecutor to investigate and prosecute those who have used, ordered, and authorized the use of waterboarding and other forms of torture? If you are not represented by a member of the Senate Judiciary Committee, then call the committee staff directly at (202) 224-7703. When asked at his confirmation hearing whether waterboarding used and approved by the Bush administration against detainees was torture, Michael Mukasey refused to answer because he had not been “read-in” on the details of the program. Well, after nearly three months as Attorney General, Mukasey has had plenty of opportunity to get any information he said he needed. Having been “read-in” on the U.S. interrogation programs, what does Attorney General Mukasey think of waterboarding now? On January 30 at 10AM, he will have a chance to go before the Senate Judiciary Committee that voted to confirm him and answer precisely that question. 1. 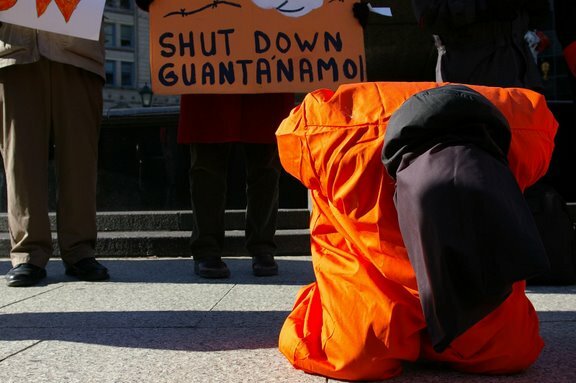 Is the use of waterboarding as an interrogation technique illegal under U.S. law, including treaty obligations? 2. Based on your review of other coercive interrogation techniques and the legal analysis authorizing their use, what is your assessment of whether such techniques comply with the law? 3. Was the authorization of waterboarding criminal under the War Crimes Act, the Torture Statute, or other applicable laws? 4. Was the use of waterboarding criminal under the War Crimes Act, the Torture Statute, or other applicable laws? (1) Forcing an individual to be naked, perform sexual acts, or pose in a sexual manner. (2) Placing a hood or sack over the head of an individual, or using or placing duct tape over the eyes of an individual. (3) Applying a beating, electric shock, burns, or other forms of physical pain to an individual. (4) Subjecting an individual to the procedure known as `waterboarding’. (5) Subjecting an individual to threats or attack from a military working dog. (6) Inducing hypothermia or heat injury in an individual. (7) Conducting a mock execution of an individual. (8) Depriving an individual of necessary food, water, or medical care. 4. Will you appoint a special counsel to conduct a full, public, and impartial criminal investigation on the authorization or use by U.S. personnel or assets of any of the above mentioned techniques against detainees? 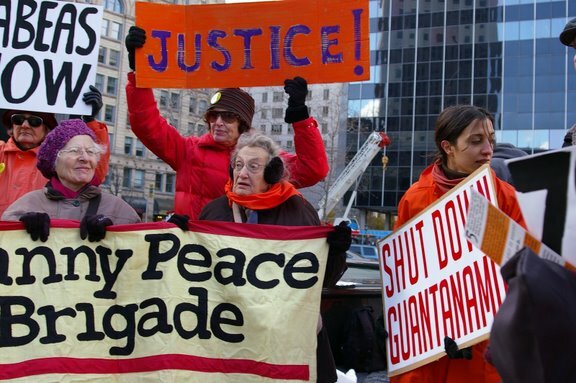 Students and activists held protests on campuses and in front of federal court houses in solidarity with Guantánamo detainees in the lead up to the Supreme Court hearing oral arguments December 5, 2007. The Court in the Boumediene case is set to decide the question of whether detainees can challenge the lawfulness of their detention in court through the centuries old legal guaranteed of habeas corpus rights. Currently, the government claims the detainees, held indefinitely without charge on the island prison, have no right to appear before a judge. Members of Witness Against Torture protested in front of the Supreme Court itself, making for a striking juxtaposition of the symbols of injustice and supposed justice. The protests were coordinated in large part through the work of Susan Hu at the Center for Constitutional Rights. Listen to the audio recording or read the transcript.